At this point all I have to say is that very often we get offended by other people because of our own perceptions and not because the other person is actually being rude. Many times we are offended by what the other person says simply because we choose to be offended. In most cases it really is just a matter of choice and we have the choice to be offended or not. Not everything is going to be said in the manner that we want it to be, so try to be a bit more tolerant of other people as I can say for sure that no one is actually trying to offend anyone else. If you want to be offended by the way a person says things, do not go on an attack on the forum deal with it through the PM service or let it go, the forum is not really for a lot of discussion about how rude you think someone is, it is about helping people with their parrots. I have a couple of the java perches and they should work great for your birds as long as they fit the birds feet. that is the biggest issue when buying them online. Another thing that I would consider is that with the larger birds you may want to get them long enough to reach across the cage so that they can be supported from both ends and not just one. Hope this helps. Brandon, your telling me that you and Seagoatdeb are my foes makes absolutely no difference to me. But, if it makes you feel better (which, apparently, it does), go ahead, be my guest - although I seriously think that Seagoatdeb is so infantile as to consider me her foe - at least, I hope so for her own good! ParrotsForLife wrote: Chantilly its nothing got to do with you and you don't know whats been going on so stay out of it its between me Deborah and Pajarita and its over now we have her blocked so we don't have to deal with her RUDENESS anymore. Brandon, I know it has nothing to do with me, but it dosn't mean I dont read all these posts, and when I do read the ones like the one I quoted you on, I cringe at them. I was only trying to lighten things up a bit, IMO, who cares that you, Paj and Deb have different oppinions, try to laugh a bit. Dont let people offend you, If it is not constructive critism,it cant help you so ignore it or laugh at it! The world is trying to help you, not pull you down, you just need to be able to differentiate bullying with contructive criticism. One of my sibblings takes great offence at every little thing that is not praising him, and I have been telling him the EXACT same thing as I have just told you. Your right I wont let her offend me anymore and now she cant. Wolf wrote: At this point all I have to say is that very often we get offended by other people because of our own perceptions and not because the other person is actually being rude. Many times we are offended by what the other person says simply because we choose to be offended. In most cases it really is just a matter of choice and we have the choice to be offended or not. Not everything is going to be said in the manner that we want it to be, so try to be a bit more tolerant of other people as I can say for sure that no one is actually trying to offend anyone else. If you want to be offended by the way a person says things, do not go on an attack on the forum deal with it through the PM service or let it go, the forum is not really for a lot of discussion about how rude you think someone is, it is about helping people with their parrots. Your right this forum is for Parrot talk not about whats going on between any of us. Pajarita wrote: Brandon, your telling me that you and Seagoatdeb are my foes makes absolutely no difference to me. But, if it makes you feel better (which, apparently, it does), go ahead, be my guest - although I seriously think that Seagoatdeb is so infantile as to consider me her foe - at least, I hope so for her own good! Did you just call me infantile! Well I have nothing to say about that behaviour. Your name calling speaks for itself. Wolf mentioned the foe button and then asked me to tell him how it worked. I tried it out. Brandon was upset about your posts so i suggested he try it out to if it would help him to fell better. End of story!!!! It is a function of this forum plain and simple. I was taking a break from the forum and spending less time on my computer and yet i am being called names when I am not even here. If this was not a personal insult please expain where you are comming from on this. Hold up guys. If you read the sentence, I think that you will see that it makes no sense as it is worded, it has got to be a typographical error and it should obviously read that Pajarita does not think that you are so infantile as to think of her as your enemy. Please look at it again. Wolf wrote: Hold up guys. If you read the sentence, I think that you will see that it makes no sense as it is worded, it has got to be a typographical error and it should obviously read that Pajarita does not think that you are so infantile as to think of her as your enemy. Please look at it again. I think only Pajarita can say what she meant. I should have said "I seriously DOUBT that Seagoatdeb is so infantile as to consider me her foe" or "I don't think that Seagoatdeb is so infantile as to consider me her foe" but, even though it might not have been perfectly correct from a grammatical point of view, I think the meaning was actually pretty clear -and, in truth, I was trying to make you, Seagoatdeb, look better than what Brandon's words portrayed. Alright, Pajarita has replied as to what was meant in her posting and although she still worded it differently than what I did the meaning is still the same as what I said it would be. It is the only way that the actual wording makes any sense. I have been patient and have been very supportive and Pajarita has made several concessions in trying to not offend you and others. But it really does not seem to matter because you are nearly always offended whenever someone says anything that you do not agree with. I have done this privately with you and Brandon and Pajarita as much as possible and asked everyone to keep this junk off of the forum and to work it out using PM's, but am not getting a lot of cooperation in this regard, which is why I am doing this here and now. 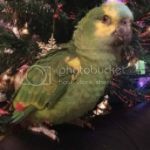 This forum is for talking about parrots and assisting people with their parrots and this type of thing is not what the OP ask for nor is it what they should have to contend with. Work out your difficulties with each other through the PM, or don't reply to each other, I don't care which, but it does not belong here. End this now, please. Pajarita wrote: I should have said "I seriously DOUBT that Seagoatdeb is so infantile as to consider me her foe" or "I don't think that Seagoatdeb is so infantile as to consider me her foe" but, even though it might not have been perfectly correct from a grammatical point of view, I think the meaning was actually pretty clear -and, in truth, I was trying to make you, Seagoatdeb, look better than what Brandon's words portrayed. You have explained, that is fine. More carefull consideration of words will keep so many from reacting to your words. Please do not bring me into your fights again, either of you, and let it end here.